Creating UML activity diagram with free templates and examples. UML activity diagram has never been easier. UML activity diagram is an important diagram in UML to describe dynamic aspects of the system. UML activity diagram is basically a flow chart and it illustrates the dynamic nature of a system. In UML, an activity diagram is used to display the sequence of activities. 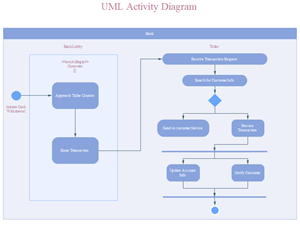 UML activity diagrams are useful for business modeling where they are used for detailing the processes involved in business activities. Edraw UML activity diagrams will enable you think more functionally by helping you describe the flow of control of the target system, a method, function or operation in software, etc. 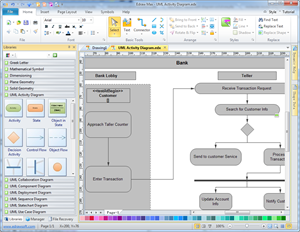 Edraw offers the easiest way to create UML Activity Diagram. With a wide range of pre-made vector stencils and samples, you can simply use drag-and-drop function to finish your drawing. The intuitive interface and automated tools help you to customize your drawing with free templates. We also have a lot of examples for your reference. Edraw is ideal for software designers and software developers who need to draw UML activity diagrams. Edraw software includes many special shapes used in the UML activity diagram, activity, state, object in state, decision activity, control flow, object flow, horizontal synchronization bar, initial state, final state, swimlane, vertical synchronization bar, etc. You can take advantage of this UML Activity Diagram Template fully customizable to have amazing drawing result.